It is almost spring time and when this season drops in, everyone is all set to give their house a new look by cleaning it up or buying some new things. If you are planning to clean out your carpet this time, you should be absolutely sure about where you are getting it done from. Will you be doing it yourself at home or giving it in the hands of a professional? So if you are planning on getting a carpet cleaning service to do the job for you, you need to be very sure of whom you are hiring for the job. Of course, you have seen so many advertisements on TV about millions of carpet cleaning services and they make everything look so great for you. However, you cannot get impressed without doing your homework. You have to make sure that you the carpet cleaning service that you are hiring is worth all your money. Below you will see some points that can help you choose the perfect carpet cleaning company. · If you have absolutely no idea about carpet cleaning companies, you need to first ask people who do. You can go around asking your friends, relatives, or your neighbors, and if they hire carpet cleaning services then which one. · Make sure that when you are doing your homework, you are also taking care about the money you have in your wallet. You should be absolutely sure about the company before being ripped off. The money being worth it or not, does matter, after all it is your money. · Do not get carried away with what the company tells you, they are very good with advertising their services and sometimes people fall for their talks. If you have noticed, they always talk about the most expensive service that you should be choosing. · Make sure whatever package you choose, you get it all in writing and know exactly what the workers will be doing on your carpet. These are some points that you should know before hiring a service company, however the carpet cleaning service in Singapore gives you everything that you imagine. It is the solution to all your problems. They are the best in the whole city and they make sure that it is a job well done. The staffs that work for these services are experts in the field and provide the best. The employees know exactly how you feel and they also make sure that you know them before they come into your house to start their job. Whether you need your office carpets to be cleaned or your home carpets, the carpet cleaning Singapore, will be able to do everything you need them to. Everyone needs their carpet to be clean, if it is not clean, the design on your carpet will never show. Do you know that when your carpet gets dirty, it not only gets dirty because of the dust that accumulates but also fungus, bacteria and other such microorganisms gets stuck to it. If you hire a professional, they will be able to take out everything right from the core, leaving your carpet just like how it looked the first time. The advantages of the carpet cleaning company are as follows. 1. Do not worry about walking on your carpet when the cleaning is going on because the carpet cleaning Singapore has your carpet dry at all times and you can definitely make a few trips. 2. Your carpet does not need any time to dry after the cleaning service is over. So there is no need to turn your dryer, or your fan or your air conditioner on just for your carpet to dry. The carpet cleaners clean your carpet leaving it absolutely dry. 3. This cleaning company does not just clean on the surface of the carpet, but also makes sure to keep the chemical products out of it, so that it does not cause any harm to the carpets. You should not be under that misconception that you should only clean your carpet when it looks dirty. Actually, if it looks dirty that means that you cannot even begin to imagine how dirty it really is and just a vacuum cleaner will not be able to complete the job for you. You will most certainly need a professional to come and clean all the dirt away and remove every minute thing that they can possibly take out. It will be very difficult if you plan to do the carpet cleaning on your own, because it is a lot of hard work. If you hire a professional cleaner to do the job, they will know exactly which machine to use based on the carpet. Professional carpet cleaners usually look at the following before starting their job. – They check the type of the carpet, because some carpets take longer to clean. – They check the dirt in your carpet. If you have not cleaned your carpet for months or even years, that means that there is a lot of dirt that has accumulated and this will also take a long time to clean. – They also take special care for some spots on your carpet, if they think it is necessary. – They also want to know beforehand if there is any furniture that you would like to remove before they get their cleaning started. 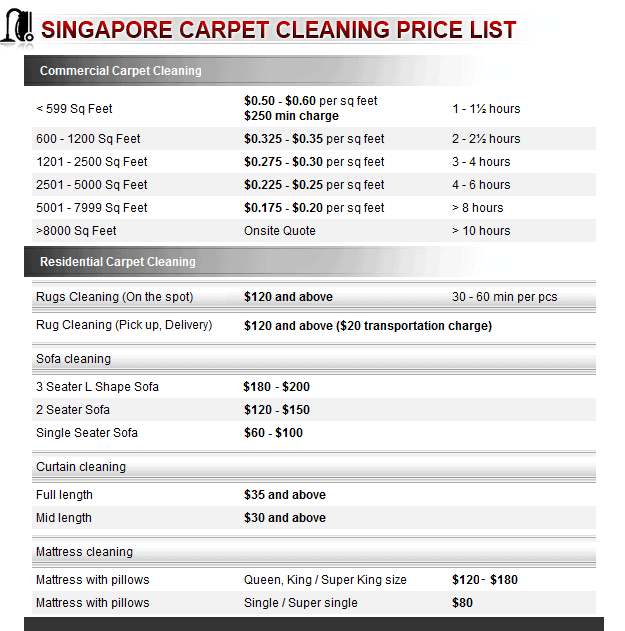 If you are still wondering why you should choose the carpet cleaning Singapore, and if you are still having a hard time to trust them then you should log on to their website, where you will be able to read the customers testimonials and you will see how satisfied they are with their services. If you do not try it out, you will never know if they are good or bad and when you do decide to check them out, you will never ever hesitate to call them to your house again. These experts do a splendid job and they make sure that they leave you with a smile. Always be sure to keep your carpet clean not only because it needs to be kept clean, but also because you need to take care of your family. By not keeping it clean, you never know what sickness can occur in your house. So be safe and always call a professional to do the job for you.